Citation Information: JCI Insight. 2017;2(14):e93885. https://doi.org/10.1172/jci.insight.93885. Increasing NAD+ levels by supplementing with the precursor nicotinamide mononucleotide (NMN) improves cardiac function in multiple mouse models of disease. 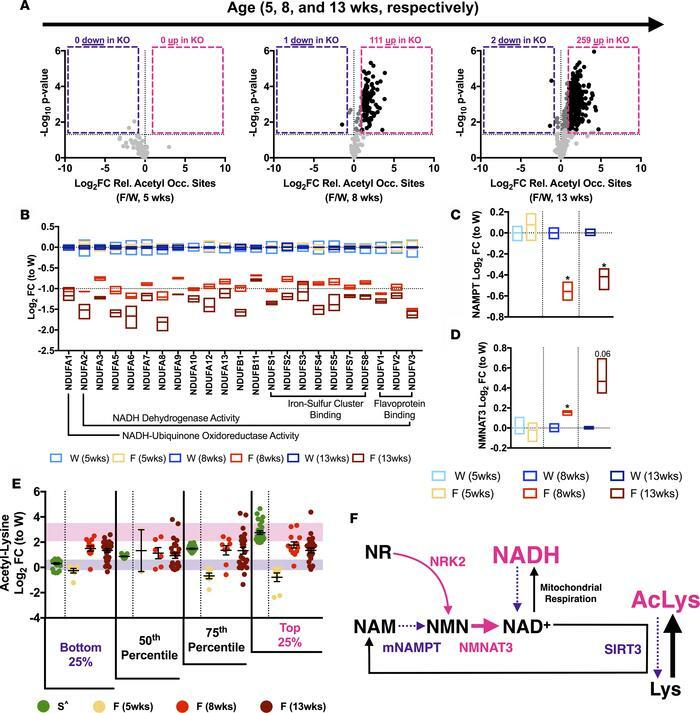 While NMN influences several aspects of mitochondrial metabolism, the molecular mechanisms by which increased NAD+ enhances cardiac function are poorly understood. A putative mechanism of NAD+ therapeutic action exists via activation of the mitochondrial NAD+-dependent protein deacetylase sirtuin 3 (SIRT3). We assessed the therapeutic efficacy of NMN and the role of SIRT3 in the Friedreich’s ataxia cardiomyopathy mouse model (FXN-KO). At baseline, the FXN-KO heart has mitochondrial protein hyperacetylation, reduced Sirt3 mRNA expression, and evidence of increased NAD+ salvage. Remarkably, NMN administered to FXN-KO mice restores cardiac function to near-normal levels. To determine whether SIRT3 is required for NMN therapeutic efficacy, we generated SIRT3-KO and SIRT3-KO/FXN-KO (double KO [dKO]) models. The improvement in cardiac function upon NMN treatment in the FXN-KO is lost in the dKO model, demonstrating that the effects of NMN are dependent upon cardiac SIRT3. Coupled with cardio-protection, SIRT3 mediates NMN-induced improvements in both cardiac and extracardiac metabolic function and energy metabolism. Taken together, these results serve as important preclinical data for NMN supplementation or SIRT3 activator therapy in Friedreich’s ataxia patients. FXN-KO cardiac mitochondria have protein hyperacetylation, redox imbalance, and altered NAD+ homeostasis. (A) Difference in mitochondrial protein acetylation relative occupancy sites (i.e., acetyl peptides quantification corrected for change in protein abundance) between WT and FXN-KO at 5, 8, and 13 weeks of age. Black represents statistically significant (Padjusted ≤ 0.05) acetyl sites with FCs above 2- or below –2-fold; dark gray represents FCs in between; and light gray represents acetyl sites with no statistically significant FC. (B) Proteomic measurements of OXPHOS complex I subunit levels in WT and FXN-KO heart mitochondria at 5, 8, and 13 weeks of age. Bar line represents sample mean. Subunits shown are statistically significant from respective WT (at 8 and 13 weeks). (C–D) Proteomic measurements of NAD+ biosynthesis proteins NAMPT (C) and NMNAT3 (D) in WT and FXN-KO heart mitochondria at 5, 8, and 13 weeks of age. Bar line represents sample mean. (E) Statistically significant acetyl-lysine sites in common between the SIRT3-KO whole hearts (green; ^ from ref. 28); and FXN-KO heart mitochondria at 5, 8, and 13 weeks of age (shades of red). Purple and pink shading represents 1 SD from the mean of the bottom and top, respectively, 25% SIRT3-KO sites. (F) Schematic summarizing shifts in the mitochondrial NAD+ metabolome in the FXN-KO heart. *P < 0.05, difference from respective WT values at each age group by Student’s t test and Benjamini-Hochberg FDR correction; n = 3 mice per age group per genotype. W: WT, F: FXN-KO and S: SIRT3-KO.